A group of activists are creatively protesting against the effects of the Immigration Act 2014 on migrants’ access to NHS services. On 6 April 2015, new immigration health surcharges came into force under the Immigration Act 2014. These surcharges affect non-European Economic Area (EEA) nationals who come to the UK to work, study, or visit their families for a period of longer than six months. They also apply to non-EEA nationals who are already in the UK and apply to extend their stay after 6 April 2015. It is only after this surcharge has been paid that those affected will be able to access NHS services. It is necessary to pay the surcharge before an immigration application has been completed, and if it has not been paid the application will automatically be rejected. Those from non-EEA countries not required to pay a surcharge upfront, such as those with visitors’ visas, will be charged 150 per cent of the cost of the treatment received on the NHS. If those who are chargeable fail to pay and incur over £1,000 worth of debts, they will be refused permission to re-enter and/or remain in the UK. Instituting this scheme will drive vulnerable migrants away from NHS services. It will force doctors and health services to question people’s immigration status, to ascertain whether they have the right piece of paper which guarantees them the free treatment we currently enjoy. No one should be afraid to go to the doctor, either because they can’t pay or might be punished. No doctors should have to police the people they treat. A small group of medical students, doctors, nurses, HIV activists and concerned residents, Docs Not Cops use street theatre to gain attention and mimic the insidious policing of immigration statuses within hospitals. 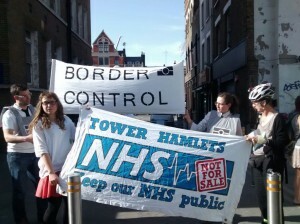 At the demonstrations earlier this month, activists dressed as border control agents, and standing underneath a border control checkpoint, stopped people walking around the hospitals to ask whether they were aware of the recent changes to access to healthcare, whilst demanding proof of whether they fulfilled the necessary criteria to access NHS treatment. 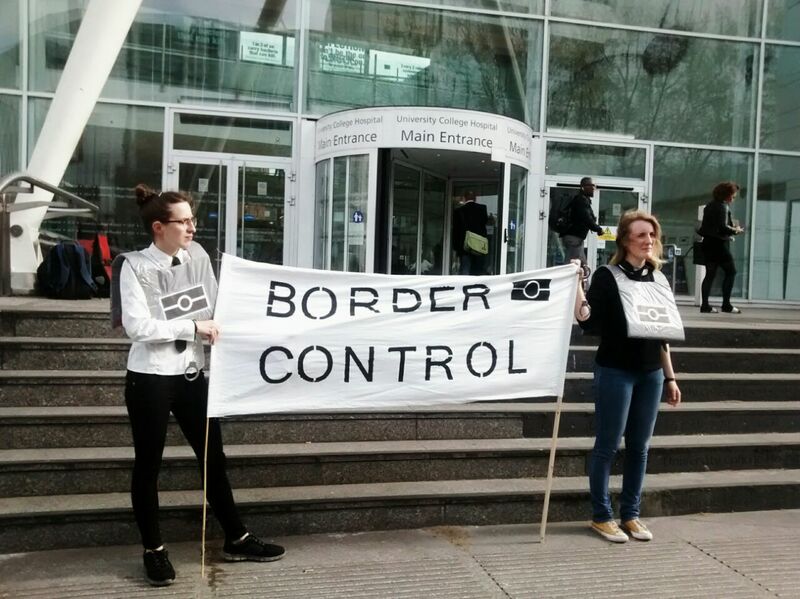 Other activists dressed as doctors handed out leaflets to passers-by, including medical professionals, and discussed the recent changes to access to healthcare for migrants. Most people responded positively to the group and their aims. While migrants will not be refused access to the NHS for GP and emergency treatment, the effects of the Immigration Act on the universality of the NHS are clear. Access to treatment under the NHS will be conditional upon immigration status and financial means, with the risk that some migrants will not be able to afford to seek medical advice or treatment, or will fear punishment for not carrying the right papers. The inquest verdict announced on 15 April in the sad case of Dalton Messam (44), an undocumented migrant who died in 2013 in East Ham from an unknown illness, too afraid to seek medical treatment in case he was deported, is testament to the potentially fatal consequences of limiting or cutting off access to healthcare for migrants. usually people don’t speak about these issues.